Home	/ Travelogue / The UK experience – inspiring and rejuvenating! The UK experience – inspiring and rejuvenating! A visit to London and the rest of UK is always an exciting prospect. The unpredictability of the weather, the opportunity to meet with old friends and the warmth & hospitality of our SVYM members enthused and left me filled with expectation. And I was not disappointed. London was reeling under an unusual absence of rains and was at its hottest best. It was 31 degree Celsius when I landed at Heathrow on July 9th evening. Devaraj was there to pick to me up and took me to his house at St.Albans. His two lovely twin daughters were asleep by the time we reached his place. The next day was to be a long one. Devaraj and his wife Jayalatha were busy with the last preparations for the charity event later that evening. Sindhu drove down nearly 220 miles from Manchester to pick me up and take me to the talk at Basingstoke. I was to speak in the afternoon and we thought we left early at 12.30 itself. Little did I realize that construction activity in preparation for the 2012 Olympics has left London’s main motorway, the M25, congested and a virtual parking lot. What should have taken us one hour took us nearly two and a half hours. The organizers of this Kannada Balaga event were gracious and had moved my talk to 4.15 p.m. The response at the event was indeed very positive and forebode well for what was in store. Thanks to Mohan Arkanath for creating this opportunity for us to present SVYM at this large stage. Kannada Balaga has supported us many times in the past and I was surprised to hear that they had made me an honorary member of the Balaga many years ago. The Charity event in the evening was a well attended one. Balaji and Vivek had come in from London. Chandrappa and his family came in from Cambridge. It was past midnight by the time we settled for the day. I was woken early at around 5 am by loud metallic noises. Devaraj was up early cleaning all the utensils that were used the previous day. Cleaning them himself meant that he could save an additional 50 pounds for SVYM. The same commitment from the same old Devaraj! I remember the early days, when Devaraj was the treasurer and how he always made sure that we got value for every rupee spent. We had originally planned on visiting London the next day and meeting up with Swami Dayatamanandaji there. Both of us were so tired that we just could not get ourselves to do anything. Devaraj drove me early on Monday morning (12th) to Bourne End where the Vedanta Center is located. We spent the morning there and met with Swami Dayatamanandaji and Swami Veetamohanandaji. It was a nostalgic moment. Swami Veetamohanandaji had been the chief guest of SVYM’s first anniversary function at Thumnerale and it was he who had introduced me to Swami Achalanandaji, my mentor and guide. Swami Veetamohananda was also the person who had provided refuge for Devaraj and Ramesh in December 1987 when things had become difficult for us at Brahmagiri. We then proceeded to Sheffield where David Sorsby and his partner Helene had organized a talk. Both of them had volunteered with us a few years ago and taught English at our tribal school at Hosahalli. Enroute we visited the famous Balaji temple at Birmingham. Sanjeev Gupta had come down from Leeds and met us at Sheffield and drove me with him. Felt like a relay baton being passed from Devaraj to Gupta! Gupta had applied for leave for the next 3 days to be with me. He had organized a talk on ‘Role of NGOs in developing countries’ at the Sovereign Theatre at the Royal Bradford Infirmary. This is easily one of the best places that I have lectured in. The theatre was very tastefully done up and had all the latest gadgets. Watching the movie of SVYM here was an experience to treasure. The post talk discussion kept extending and Gupta has to literally drag me to the venue of the next event, which was at Hotel Aagrah in Bradford itself. More than 30 Indian families had come and the talk over dinner was well received. 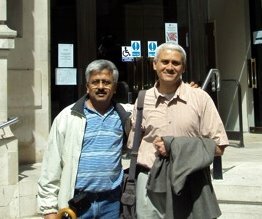 It was such a joy to meet with Dr. Manjunath Prasad, a classmate of mine, after so many years. What was touching was that he had driven more than 4 hours on a busy working day to be with me. Early the next day (14th), Gupta took me to the local temple. The Pandit there was a PhD scholar and a very learned person. What touched me was the spontaneity with which he donated to SVYM on hearing about our work. It is people like him that keep the motivation levels of people like us high. We then drove along Yorkshire, where the countryside is something to be seen to be believed. God is indeed partial to this place and the Pennines are a photographers delight. 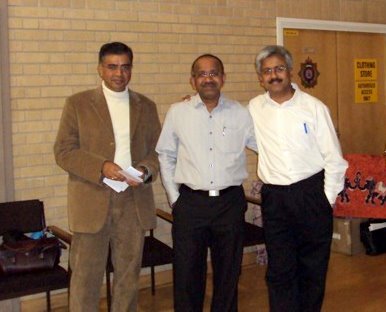 The next meeting was at Raghuram’s house at Hull. He had some of his friends and colleagues for the evening. Between visits to the hospital, Kala (Raghuram’s wife) made sure that we were well taken care of. Gupta and I proceeded the next day to Manchester, where Sindhu had organized a small group meeting with some like-minded friends. Despite being under tremendous pressure at work, Sindhu was keen that I come down to Manchester. Was wonderful meeting with some of her friends and interacting with them. The Bisi Bele Bath that she served was something to remember to remember the day by! After bidding farewell to Gupta and Sindhu, I traveled by train from Manchester back to Watford, where Devaraj was patiently waiting to pick me up close to midnight. Friday (16th) was a day that I had kept to meet with friends and other acquaintances from Harvard. I also went to London to meet up with Vivek, who was his usual uncertain self. Uncertain but wanting to be sure that his career choices were right and risk free. As far as Vivek goes, the only change that I have seen in the 25 years of my knowing him is that his hair has been growing grayer and his teeth have been falling off in pieces. He proudly showed off LSE and LSHTM, his alma maters now. Could not believe that so much wisdom and research comes out of these small Victorian buildings! We proceeded on Saturday the 17th to Cambridge, where Chandrappa and his family had organized a Charity evening. This well attended meet was a delight to be a part of. Balaji had come down from London, despite running a viral fever. 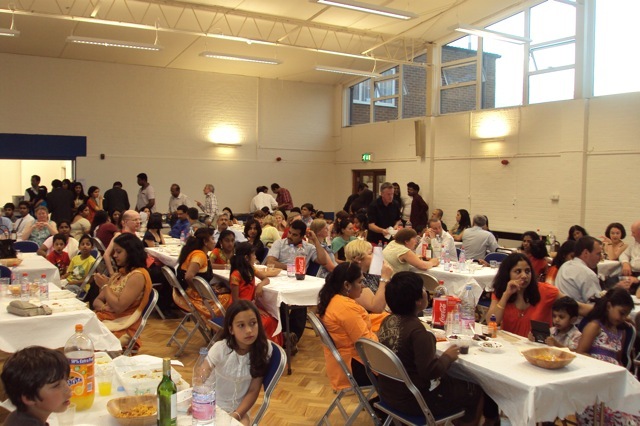 Mridula had come from Brighton and took on the responsibility of decorating the venue and the dinner tables along with her friend Dr.Chandrika. Another classmate, Dr.Harish drove nearly six hours to be with us that evening. Gupta and his family were there. It was such a wonderful feeling to watch the entire team work together. The feeling was nostalgic and I was reminded of our first anniversary function at Thumnerale and the hospital opening at Brahmagiri and the many such events that we had later. All these events always brought out the best of teamwork and camaraderie in each of us. Over time, as the organization grew, we had more hands to do the work, but am still not sure if we have as many hearts. This event to me personally was rejuvenating and lifted my tired spirits. Surprisingly, I was yet to get over the jet lag even after a week of my reaching UK. On Sunday the 18th, I reached Eastham, close to London. Balaji was insistent that he host a lunch at one of the popular Indian restaurants. Despite the years, Balaji has not changed a bit as far as his love for good food is concerned. He gave a running commentary on the different varieties of food served on the many Indian restaurants in London. Vivek was his usual frugal self and focused mainly on the sweets and desserts! Both of them then took me by the famed London tube to Heathrow. As I sat in the airport waiting for the boarding call, I was thinking of this past week. So much action and such an exhausting schedule! I was left overwhelmed by the love, affection, hospitality, and support shown by each one of them. Watching such senior physicians and consultants take time off from their busy professional lives and being with me all the time was a privileged feeling. The discussions were so engaging and informal. All in all, I was made to feel special. When I decided to accept the invitation, I felt that I needed to reconnect and rebuild relationships. Once I was there, I realized that the relationships were strong as ever. Like the saying goes, ‘for a friend, there is indeed no place like faraway’. It was a tiring but an extraordinarily inspiring and enthusing week. Devaraj wanted me to come to inspire the UK team, but what I now realize is that I return so much inspired. Inspired by the strength and power of a committed team; inspired by the energy of so many fellow Indians wanting to give back to their country and its people; inspired by Gupta’s daughters who gave away their pocket-money to SVYM; inspired by the children of Devaraj, Gupta and Chandrappa who went around selling raffle tickets to raise funds for the projects in India; inspired by humanity and its intent to make sure that the fight against poverty continues unabated.